NBC crossed a lot of comic book fans by canceling Constantine earlier today, and they’ve gone a step further and scrapped a handful of other freshman series, as well as one of their sophomore comedies. Audiences can now hum “Taps” while saying goodbye to the political drama State of Affairs, the boys being boys comedy About a Boy, the couples comedy Marry Me and the alternative lifestyle comedy One Big Happy. State of Affairs was to be the next big TV project for Katherine Heigl, who left Grey’s Anatomy under suspenseful circumstances, but it looks like Shonda Rhimes’ presence would have been a bigger safety net. The series, which starred Heigl as a CIA analyst working with Alfre Woodard’s U.S. President, premiered in November to a sizeable audience of over 8.6 million people, but minimal acclaim and lukewarm ratings as the 13-episode season went on held it back from entering the cultural zeitgeist. Its February finale, which ended with a cliffhanger, brought in just over 4.4 million viewers. 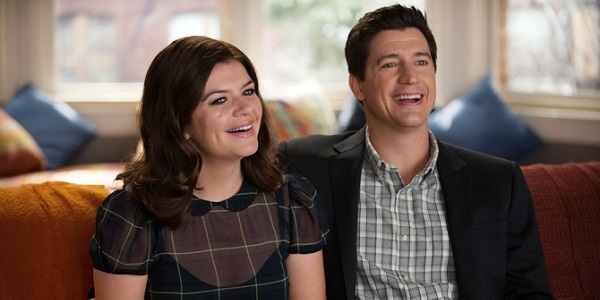 Despite coming from Happy Endings creator David Caspe, and starring that series’ Casey Wilson and the always hilarious Ken Marino, Marry Me struggled in the ratings department as the weeks went by, seeing the premiere’s 7.5 million-strong audience tumble down to around 2 million for the last episode that aired In February. Despite having an enviable lead-in slot ahead of The Voice, viewers just weren’t interested, and NBC ended up pulling the season’s last four episodes, which still haven’t aired in the U.S.
Like Marry Me, About a Boy saw its favorable ratings take a steep decline over the course of its one-and-a-half seasons. The David Walton-starring adaptation of Nick Hornby’s popular novel was pulled from NBC’s schedule in February, with six episodes that still haven’t aired. It seemed likely that the show would be canceled, though NBC’s lack of commitment either way seemed like they might keep it around. Nope. And then there’s One Big Happy, a series that seemed doomed from the start, as it starred Elisha Cuthbert as a lesbian having a baby for her best friend, played by Nick Zano, who is in a serious relationship with Kelly Brook. How was this not a Fox comedy in 1989? With only a six-episode Season 1, it didn’t have time to fall to the same depths of NBC”s other sitcoms, but it still dipped heavily after its critically lambasted premiere brought in 5.4 million viewers. So I guess we all know how NBC feels about their own new shows, which means we probably shouldn’t get too attached to whatever they’re ordering up this year. To find out more about your favorite shows’ futures, check out our cancelation/renewals rundown here.